“Narcissus Garden” will be on view in a former train garage at Fort Tilden from July 1 until Labor Day. Now that summer is officially here, it’s time to hit the beach! New Yorkers who like their sunshine and saltwater with a side of art should set theirs sights on the Rockaways, where, beginning next weekend, a large-scale Yayoi Kusama installation will spread out just steps from the sand. First presented by the artist as an unofficial project outside the Italian pavilion at the 1966 Venice Biennale, “Narcissus Garden” (1966) consists of 1,500 reflective orbs spread throughout a space. 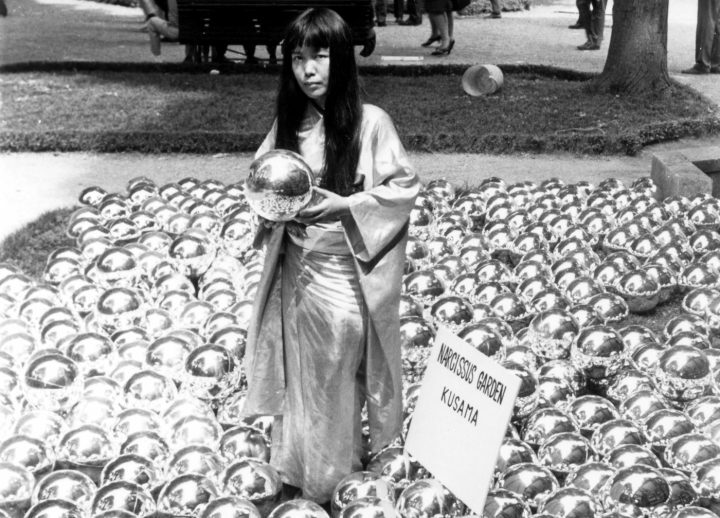 In the work’s first iteration, Kusama wore a golden kimono or red onesie and stood amid the plastic orbs alongside signs that read “Narcissus Garden, Kusama” and “Your Narcissism for Sale.” As part of the performance, she entreated passersby to buy the orbs for 1,200 lire apiece (about two dollars). The work is considered a breakthrough in Kusama’s career, marking her shift toward large-scale installations and projects that involve performance and interaction. 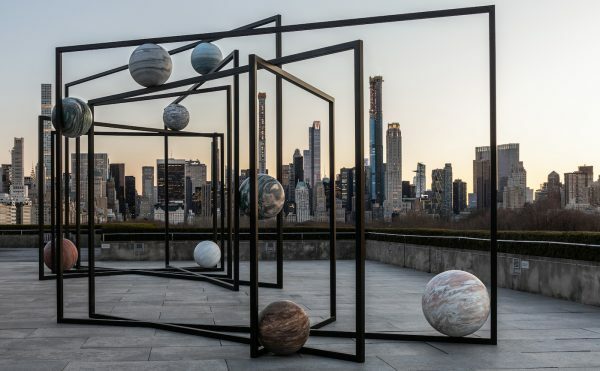 “Narcissus Garden” has been shown far and wide since its renegade debut in Venice, though in subsequent iterations the plastic orbs were replaced with more durable stainless steel. Audiences in the New York City area may have seen “Narcissus Garden” most recently in 2016, when it was installed on a pond at Phillip Johnson’s Glass House in New Canaan, Connecticut. 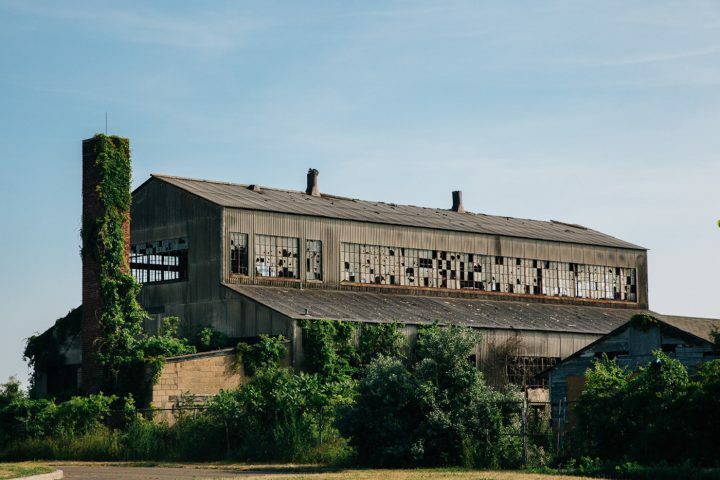 In the upcoming iteration, the worn industrial charm of the venue — the T9 building, a former train garage in the Gateway National Recreation Area at Fort Tilden — will contrast sharply with the pristine reflective orbs. The Kusama installation at Fort Tilden, which will remain in place through Labor Day (September 3), is part of the third annual “Rockaway!” public art festival co-organized by MoMA PS1, the Rockaway Artists Alliance, the Jamaica Bay-Rockaway Parks Conservancy, the National Park Service, and Bloomberg Philanthropies. 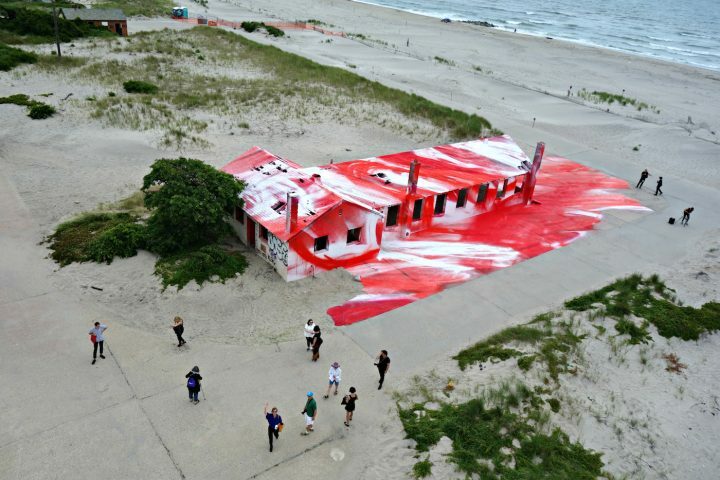 Two years ago, the festival brought a similarly Instagram-friendly installation to Fort Tilden: Katharina Grosse’s sprawling, chromatic intervention “Rockaway!”, which covered another abandoned, hurricane-damaged structure and the surrounding grounds. Yayoi Kusama’s “Narcissus Garden” opens on July 1 in the T9 building at the Gateway National Recreation Area at Fort Tilden (Breezy Point, Queens) and will remain on view through September 3.